This is a curious book that tries to be great - and it almost succeeds. 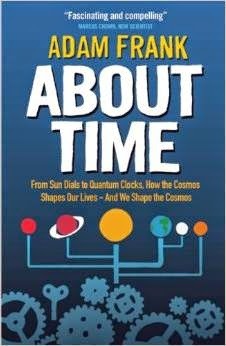 Adam Frank makes a determined effort to interweave two apparently unconnected strands of science and technology history - the personal appreciation of time in human culture and our cosmology. Along the way he brings in a whole host of little details - whether or not you feel that the main aim of the book is successful, there is plenty to enjoy in here. Sometimes the interweaving is impressive. For instance, I knew that Einstein came up with his special relativity with its very different views of simultaneity while he was working in the Swiss Patent Office in Bern. But I had assumed the work was a sinecure he got out of the way quickly before thinking his important thoughts. Frank points out that much of the patent material he was working on would be about electrical synchronisation of clocks - a concept with simultaneity at its heart - so could be directly inspirational in his thinking. All in all, then, a noble effort, and there was much to like, but it just didn't quite work for me.